Unlike my comps and my proposal, I didn’t exactly get a clear pass on my dissertation. Instead, I got a pass with revisions. Revisions included getting the length of the dissertation closer to 350 pages (from 450–ouch! ), fixing some formatting issues, and a few other mostly minor changes. I was able to get all the changes made in just a few days, but then I needed to get approval from my first reader and also from the document assistant (the person responsible for checking formatting). That took more than a couple of days and as a result I didn’t quite get done before we had to leave for the States. That meant I had to ask for the assistance of a very helpful and willing Don Oleson who printed out two copies of the document on special archive quality paper and then hand delivered them to the document assistant who checked them out–and found a few more errors in formatting. Unfortunately, Don had to return home to Rockford, make the changes, print out the extra pages and deliver the documents once more the following day before leaving for a long trip that same day. Special thanks to Don and Luaine Oleson on that one. But that still wasn’t all. Once all the changes were made, then I had to submit an electronic copy to ProQuest, a company which archives and copyrights dissertations from all over the world. 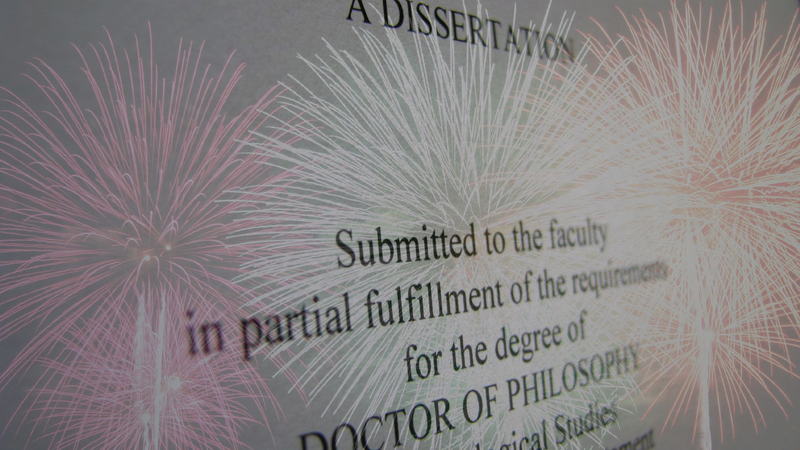 Then, once submitted, that electronic copy also had to be reviewed once again by the document fellow who only then sent approval to the records office so that now, finally, I am completely, officially done with the PhD program. A HUGE congratulations to you and your whole family!!! Just so you know, you have been and always will be quite “legitimate” with us, but I’m glad that is now your official status now at the university. Can’t wait in my spare moments to read the 350 page fruit of your labors. Until I find those moments, I am enjoying contemplating your wordle. Our whole family rejoices with yours over crossing the finish line of such a long and arduous journey. Perhaps now you can enjoy more of that Genesis creation-rest (oh, I forgot about the part of the blog post having to do with keeping up with the cute newest member of your family). Blessings to you!